One of Canada’s most endangered species, the greater sage-grouse, may have a chance to evade the threat of extinction thanks to a breeding and reintroduction program that has seen 66 of the birds released onto protected lands. The birds were released in fall 2018 into Saskatchewan’s Grasslands National Park and a southern Alberta property acquired by the Nature Conservancy of Canada. 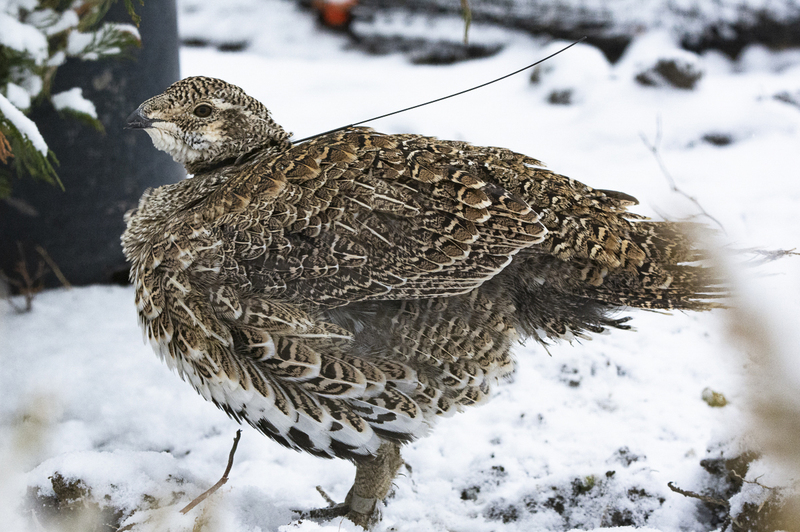 The program, a partnership between the Nature Conservancy of Canada (NCC), the Calgary Zoo and Parks Canada, with funding support from the Governments of Canada and Alberta, aims to stabilize the declining wild population of sage-grouse. “The sites that were chosen gave the birds that were being released the best opportunity to overwinter and then potentially be able to be there in the spring for breeding season,” says Bob Demulder, regional vice president for the NCC. Over the last 30 years, 80 per cent of greater sage-grouse have disappeared from Canada, with only 200 estimated to remain in the wild in southeastern Alberta and southwestern Saskatchewan. Loss, fragmentation and degradation of their native grassland habitat as well as predation and the West Nile virus have all played a part in their disappearance. Axel Moehrenschlager, director of conservation and science at the Calgary Zoo, says sage grouse are vulnerable because they have very specific habitat needs for their diet and reproduction. They depend on a plant called sage, especially in the winter. In the spring, they gather to “dance” on mating grounds called leks. This is the first time that greater sage-grouse bred in captivity — in this case in a special facility established by the Calgary Zoo in 2016 — have been released into the wild. Moehrenschlager estimates it could take at least 10 to 20 years to stabilize the population. Projections recently published in the journal Global Ecology and Conservation suggest that if sage-grouse can achieve an average annual survival rate of at least 25 per cent, then the wild population will increase by 70 animals in 10 years. Still, Moehrenschlager believes recovery is possible. He has worked closely with the Vancouver Island marmot, one of the most endangered mammals on the planet and a species unique to Canada. In 2004, there were only 33 left in Canada, but thanks to reintroduction initiatives, their numbers have increased to 250.